Fluentzy: A series of fluent English self-study books by Prof Kev Nair. Helps you achieve true fluency in English. But do you speak it fluently? "No, this is not just another crash course in spoken English..." - THE HINDU. For fluency in English. A time-honoured self-study system. For those who write good English. But can't speak English with true fluency. Here's a set of twenty highly acclaimed fluent-English self-study books. They aim to teach you how to speak English with great fluency. These 20 books, together form a single unit: A united, integrated system of building fluency in English. Prof. Kev Nair has written these books in such a way that they work together well and form a single whole. They give you complete knowledge of how to achieve true fluency in English. Yes, an encyclopedic knowledge. That is why they, together, are called the Fluency-building Encyclopedia. These books aim to help you achieve true fluency in spoken English. Like nothing else can. And they aim to help you speak English as fluently as articulate native-born people in English-speaking countries. Mind you, these twenty books are not ordinary spoken English books. They're definitive works on how to systematically build great fluency in English. In genuine spoken English. They've been authored by none other than Prof. Kev Nair. 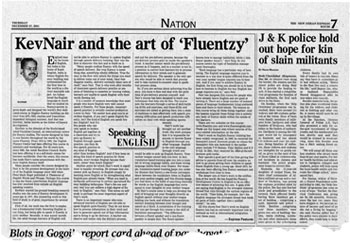 "KevNair and the art of 'Fluentzy'"
"England maybe the home of English, but India is the home of fluent English. India is where English fluency building was systematised for the first time in the world as a distinct teachable subject. An Indian loved the English language so much that ..."
As you know, Prof. Kev Nair is internationally respected as "the father of English-fluency building" and as the "father of English fluency lexicography". No other work on English fluency-building has ever been acclaimed and praised as highly and as universally as this set of 20 fluency-building books by Prof. Kev Nair. 1). Fluency-building wisdom: English Fluency Jnana™. Prof. Nair's fluency-building books teach you the unique fluency-building knowledge on which true spoken English fluency is based. 2). English fluency techniques: English Fluency Yoga™. They help you master the specialized techniques that will help you put the unique fluency knowledge into practice -- by speaking English only according to this knowledge. In real-life situations. These 20 self-study books, as a set, are ideal for use at home as a fluency-building English course. To be done solely by self-study. Yes, by total self-study. That is, anyone who knows reasonable English can make use of Prof. Kev Nair's self-study books as a self-directed English fluency course: The Fluency Development Course™. Without help from a teacher or anyone else. Without getting any coaching or any instruction from anyone. So take note of this: The fluency-building system based on Prof. Kev Nair's self-study books is not a conventional type of course of study in which you get coaching or instruction from a teacher (or anyone else) either in face-to-face sessions or through the distance-education mode. This is because Prof. Kev Nair's fluency-building system is based on the principle that nobody will be able to achieve true fluency through the coaching or instruction they get from anyone. Nobody. You achieve true fluency only when you do a course of self-directed self-study. On your own. Entirely on your own. This self-directed self-study is what it really takes to achieve fluency in English. And this is the role that Prof. Kev Nair's fluency-building books plays: They aim to make you competent enough to do this. "WHY is it that most of those who even have a master's degree in English find it difficult to express their thoughts, ideas and feelings in fluent spoken English, though they do it without much difficult in written English? "Prof. Kev Nair, an eminent scholar of international repute and a renowned English language lexicographer, goes into this question in depth and comes up with clear answers in Fluentzy, a series of twenty definitive books on the subject authored by him. These 20 self-study books, as a set, constitute a dedicated system of fluency building." How does Fluentzy® help you achieve true fluency in English? 1). It teaches you how to get rid of all the problems that prevent you from speaking English fluently. 2). It teaches you how to speak English in such a way that you're able to maintain a steady fluency in English. Through these two methods, Prof. Kev Nair's fluency-building system teaches you how to compose your speech and speak -- at the same time. At length. In detail. Spontaneously. Without prior planning. Or advance preparation. Mind you, conventional methods are only language-learning tools. And not fluency-building tools. No, they're not. So they're not capable of helping you master fluency strategies. This may sound incredible at first, but this is a fact. For example, classroom training cannot make you truly fluent in English. • Nor written English skills. • Nor e-learning. • Nor CDs. • Nor videos. • Nor language laboratories. • Nor readymade situational-English sentences. • Nor learning done through your mother-tongue. Of course, some of these methods can help you speak one-line English -- here and there: One-line statements. One-line questions. One-line replies. One-line instructions. But mind you, true fluency in English is something else. Something totally different. What is fluency? What is true fluency in English? You can’t call yourself truly fluent in English, just because you can speak one-line English here and there, can you? You’re truly fluent in English only when you can speak English continuously. At length. By giving supporting details, reasons, justifications, and illustrative examples of situations and events. Easily, clearly, confidently. Without unwanted hesitations. And by effectively managing all naturally-occurring hesitations. And by juggling with English words and word-clusters. The way articulate native-born English-speaking people do. That too, in newer & newer situations. Even in situations you’ve had no training in. Spontaneously. Without prior planning. Or advance preparation. Understand this: Every real-life speech situation brings up new twists and turns -- and throws up new speech-composition problems. And fluency in English is your ability to navigate these twists and turns -- through good English. And to keep up a steady flow of speech. So the skill of spoken English fluency is a unique skill. The only skill of its kind... And so, you can’t learn the skill of spoken English fluency in the same way as you learn other skills — computer skills, or mathematics or swimming. Fluency in spoken English needs a different approach. A completely different approach. Acquire fluency-building knowledge & skills. And whenever you speak English, speak only according to fluency-building knowledge & skills. And not according to your written English knowledge & skills. The great news is, this first step is also the last step: Master the fluency-building knowledge & skills — and whenever you start speaking in English, your words and word clusters start flowing out. Readily. Easily. Instead of just remaining on the tip of your tongue. There’s only one way to master true fluency in English: Do a self-directed self-study. Read Prof. Kev Nair's fluency-building books and learn from them. And do the skill-building drills and exercises they ask you to do. That is, make use of these books as though you're doing a fluency-building English course at home. With those books. By yourself, for yourself. That is the only way to achieve true fluency in English. No teacher-dependent method can help. You should do independent study — outside classrooms. Yes, outside. Teach yourself. Do an English fluency course at home -- by yourself, for yourself. Without a teacher. Without anyone's help. Without even depending on the distance education mode. This is what it takes to achieve true fluency in English. Prof. Kev Nair's self-study system can help you transform yourself from a person who cannot speak English fluently into a supremely fluent English-speaking professional. Far more quickly and far more easily than you think. If you already have a good or reasonable proficiency in English, Prof. Kev Nair's fluent-English self-study books can help you achieve great progress in your spoken English fluency in about 3 months. And if your present level of English proficiency is poor and not good enough, you'll need more time. But spare no effort. Don't hesitate to put in hard effort. Do a fluency-building English course at home -- by yourself, for yourself. With Prof. Kev Nair's Fluency-building Encyclopedia. Yes, to achieve great fluency in English, you have to do what it really takes. Know that the path that Prof. Kev Nair's fluency-building books take you along is the right path to take towards spoken English fluency. In fact, it is the only right path. (For reasons, read the Fluency Facts). Keep this in mind: Nothing that you do by following Prof. Kev Nair's fluency-building system goes waste. And every little that you do according to it adds to your spoken English fluency. 1). Download a copy of the Fluentzy® Handbook NOW and find out how you'll be able to achieve true fluency in English. 2). Alternatively, read the webpages on this website giving all the details you need. The Approach, Aims, Principles, Techniques, Fluency Facts, Self-study system, Self-study books, Price, etc. 3). Order the set of 20 books AT ONCE! Take advantage of the existing price structure. Don’t wait for an emergency — when everything depends on whether you have a high degree of fluency in English. Don’t wait till the day you’re called to have an important interview — press interview, radio interview, TV interview. Or a job interview or promotion interview. Or till the day you simply have to take part in an important discussion in fluent English. Or make a crucial presentation in fluent English. Or till the day you face a situation where average or below-average fluency in English would simply not do. And you simply have to speak in English that is truly fluent. With your speech units flowing out. With a stream-like flow. Don’t wait for such a do-or-die situation. Act NOW. And learn not just to speak English with average fluency — but to speak English with a high degree of fluency. Order Prof. Kev Nair’s Fluency-building books TODAY! "Speaker's encyclopaedia of fluency tools"
– THE HINDU, India's National Newspaper since 1878. "The classic fluency development solution"
"Many people consider the course designed by Nair to be the greatest development in the history of the English language since 1852 when Peter Mark Roget published A Thesaurus of English Words and Phrases. Perhaps this course is also the finest contribution English language has ever received from outside an English-speaking country." – The New Indian Express. • "Fluency in English only thro' Self-study"
• "Three Secrets of spoken English Fluency"
• "Fluency in English by the ton"
• "English fluency only thro’ English"
• "Secret of why true fluency work can’t happen in classrooms"
• "Why CDs, e-learning won’t bring fluency in English "
• "Fluency nucleus, for true fluency in English"
• "Cyber piracy of Fluentzy®"
• "Why have conventional methods failed to make me fluent in English?" • Daily inspirational quotes on the Bhagavad Gita from Prof. Kev Nair. (Also on Prof Kev Nair's twitter page). • Follow Prof. Kev Nair on Twitter. • Follow Fluentzy® on Twitter.